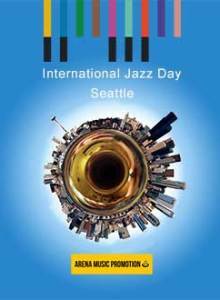 INTERNATIONAL JAZZ DAY - SEATTLE : Matthew Shipp - Michael Bisio Duo / Farko Dosumov and Alex Pinto. We are looking forward to seeing you at our event tonight. You are cordially invited to attend an amazing concert at an exclusive venue! "A must see" show at an exclusive location decked out with state-of-the art sound and lighting systems. pre-release copy of the live audio recording taken that night. Dosumov was featured on the March cover of Earshot Jazz Magazine as one of the most versatile and in demand electric bassists in the Pacific Northwest, and Pinto is quickly rising through the ranks in the Seattle music scene. Both artists will be performing on custom made glass instruments created by the Seattle-based glass artist Gary Word . Gary Word is a prolific artist who basks in the spirit of creativity. From a very early age, he embarked in a rigorous study of the work of European masters, the earliest result of which was a series of two-dimensional works such as landscapes, still lifes, and portraits. This work led to series of three-dimensional works in concrete, mortar and clay, and, beginning in 2000, kiln-formed glass. His most recent artistic endeavor, the Odyssee Project, has been ongoing for six years. This project involves the design and production of both bowed stringed instruments (violin, viola, and cello) and guitars (Stratocaster, “Violin” Bass).